Place cones in the corner of each field, split your players into two teams and put one team in pinnies. Split each of these teams into two groups and place the two pinnie groups on the end line they will defend and the other group at the end of the field as shown in the diagram. The coach stands in the middle with the ball ready to serve a ball in to one of the the four corners. When the coach plays the ball into one of the four corners one player from each corner enters the field and a 2v2 takes place. 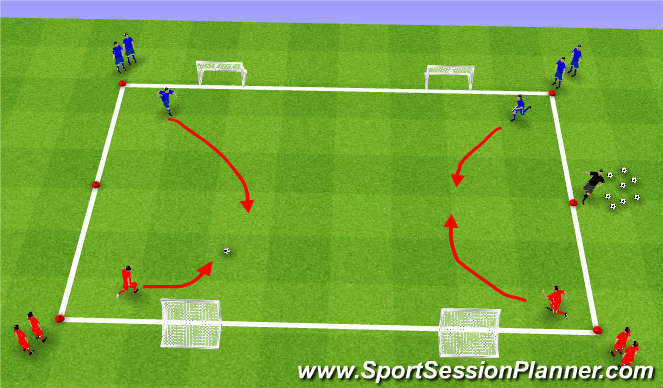 When a goal is scored or the ball goes out of bounds the coach immediately plays the ball to one of the four corners and four players from the last round leave the field. Can we create overlaps and different situations rather than playing as two seperate 1v1s.